Explore the National Trust's 2018 road trip across the Mother Road. The most enduring highway in our public consciousness, Route 66 represents a unique moment in history that continues to define the nation’s identity: the rise of the automobile and its implications of freedom, mobility, and a quintessential American story. To celebrate the legacy of the Mother Road, the National Trust and our talented road team took to the streets—literally. From July 2 to August 3, 2018, we traveled from Chicago to Los Angeles, uncovering new stories and meeting the diverse people who live along the historic route. By the trip’s end, we had shared the spirit of Route 66 with tens of thousands of travelers old and new, real and virtual—anyone who dreams of the open road. Five weeks, eight states, 2,400+ miles—read up on our road trip crew's journey from Chicago to Los Angeles, telling the story of Route 66 like never before. Thanks to Polaroid, we captured an icon through the lens of an icon. Check out our road crew’s snaps as they explored some of Route 66’s most iconic roadside attractions. 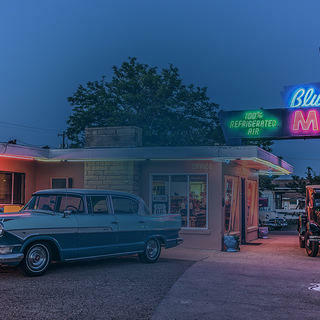 Five Roadies, three National Trust staff members, and one photographer—meet the team of storytellers who trekked across Route 66 from July 2 to August 3.